Temperature is an important measurement parameter for many process techniques used in the plastics industry. Non-contact temperature measurement using an infrared sensor system is therefore an effective method for process monitoring and control, which supports high quality levels and good process integration. Within the plastics industry, the production and testing of products is subject to numerous thermal processes. Infrared thermometers or pyrometers are often used for single point temperature measurement when the critical point within the process is known. Infrared cameras are well equipped to reveal fault points, especially the compact and fast Optris PI thermal imager. Infrared cameras help to visualise thermal procedures and therefore optimise and monitor the processes. Plastic processors produce a large variety of products with different dimensions, thickness, texture, colour and embossing patterns. Depending on the framework conditions, infrared thermometers and infrared cameras can be used to secure and improve the processes. An important application for infrared temperature sensors is the fitting of pyrometers in thermoforming and packing machines. During the thermoforming process, the material is heated to 190°C with infrared emitters and then thermally homogenised. High homogeneity over the surface and a specific set up of the converting temperature leads to higher quality results during reforming. A defined cooling range closes the process. To achieve steady product quality and avoid local combustion and crack formation, the Optris PI infrared camera is used to regulate the temperature profile during the production run. Pyrometers regulate the temperature at selected measurement points. At a customer of Optris, the infrared thermometer Optris CT LT has been set-up in one line at the heating zone exit to monitor the temperature profile and visualise temperature gradients. This allows the machine operators to monitor the complete temperature profile. To monitor the profile during embossing, the manufacturer uses Optris CT LT pyrometers measuring in single point and installed across the direction of motion. The temperature measurements are visualised at the PLC, making it possible to use the temperature traits for process monitoring. During the production of injection moulded parts, dimensional stability is of importance. During the process, the molten plastic is injected at pressure into the forming tool. The outer skin of the product then sets before it is separated. This stabilises the component, as the middle is mostly still liquid and the stored heat slowly dissipates to the outside. If too much heat is stored in the component during separation, distortion can take place, resulting in dimensions that are out of specification. The Optris PI thermal imager contributes to the optimisation of the tool temperature through the heating and cooling systems. 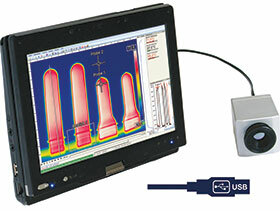 Online monitoring detects the maximum component temperature after separation. The cooling time can therefore be increased if the temperature is above specification, or reduced if it is below. Until now, only samples of the temperature were taken and longer closing times set up as a precaution – a waste of capacity. The Optris PI infrared camera solves this problem as it can be used to monitor the production temperature without disruption or contact with the parts. A resultant productivity increase occurs since more components can be produced simultaneously.